That sure looks like opal. The host looks like regular agate or jasper maybe from new mexico? Got me stumped on that one too. I agree with the jasper. Just not sure about the blue mineral. Jasper is correct for the matrix. The rock is from Brazil and the blue crystals are about a 5 in hardness. Maybe chrysoprase ? But I just looked it up and the book said it was a hardness of 7 so I dont know. Im thinking because it is in jasper host that it must be a silicate? It is in the Phosphate group. I am far from an expert but I would not expect it to be found in jasper. Apatite ? just couldnt see that being with the jasper? It seems odd but Apatite is what the dealer said and the matrix is absolutely jasper/agate of some sort. If you Google “Apatite in Jasper” you will see some similar stuff. Apatite........Strange........Usually Green,Brown,Red, Yellow, Violet, Pink and white..........Blue????? Thats pretty neat Haderly....Some of it looks real gemmy too..Nice rock! I would venture a pretty confident guess that your kyanite specimen is from the black mountains in NC. 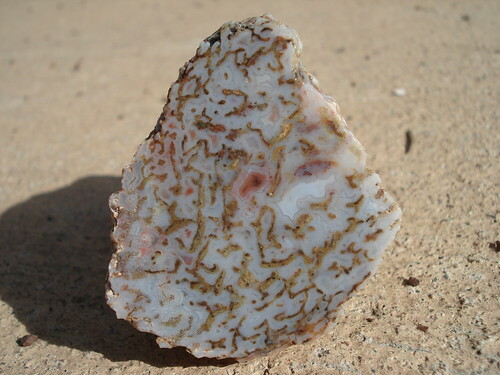 It is a type-locale piece for the area displaying the pegmatite characteristics. There are several known localities for this type material..most well known historically are Balsam Gap, Mas-Celo, and Walker Creek, but the kyanite can pretty much be found in pegmatites as far north as Bandana (near the Sinkhole Mine) and as far south as the south side of I-40 near Black Mountain. I have collected in a variety of spots all throughout this area, and have even found one boulder with associated rutile. I can rule out Graves Mtn. as the locale for your piece, the Graves Mtn. kyanite looks much different (smaller blades,more massive,and less brilliant blue). Nice piece, kyanite has always been a favorite of mine since I discovered its existence. I would say NC is home to the best specimens found in the US, its hard to match that dark vibrant blue. There has been some facet grade kyanite found over the years and it fetches a pretty penny. Thanks Bill, I was happy when I found it. I actually found a similar sized piece in the ground in Florida, so know that it is most likely my great-grandfather, who was carrying around the material. He also collected rocks. Haderly and Goldfinger are right about the Kyanite and Garnet. I will agree that in this photo it does look a little more like beryl than in person, in person you can see better that the blades are flat, like kyanite. I'm guessing maybe it was picked up at some place like Graves Mtn., Georgia, but maybe it would also have rutile in the sample if it was from there? The black mineral is biotite mica although it is hard to tell from the photo. All of the minerals are good examples of what you can find within certain grades of metamorphic rock "aureoles". My chuck will be on the saw this weekend. It looks solid enough to get some spectacular cabs. This material is not uncommon but the color is unusual. Well I learned something. I totally would not have thought it was Apatite and blue on top of that. See, there's always room for knowledge. Here's one that's unusual. These stones I've never been able to get to the bottom of. Let me give you a little bit of information & maybe it can help. I found these in '68 by chance. I just got into rock climbing & was climbing the Organ Pipes (Victoria, Australia). After I finished climbing, I noticed these unusual white inclusion in some basalt nearby. This is your typical basalt that is used for buildings as well as paving stones and gutters (curbs). I also noticed that some of them were combined with the host rock but a few, even though they were in the host rock, they weren't combined. They sort of swiveled around like a ball joint. But I was curious so I cracked the rocks open. Alot of them shattered because they were part of the basalt. But what were loose & not attached to the rock, I kept. I then threw them into a bunch of stuff that I was tumbling. From what I remember most of them vanished. A few did survive and turned out like the image below. I still don't know what the hell this stuff is :??? : :??? : I just put it aside in my collection and it's been there ever since. 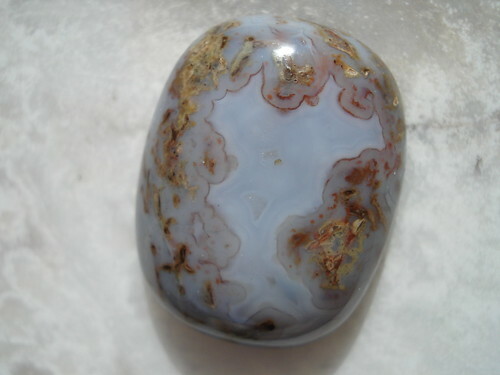 Haderly , Thats some nice looking agate....The variety is on the tip of my tongue dammit... My guess is its from Luna,NM or Morroco ? Interests:Hunt/Collect gems, minerals, fossils, corundum (sapphires, rubies), trilobites. Nuggetshooting, Computer, music, art, guns etc. I had always wondered where those pieces came from, I just copied your post and will save the information for future reference. That looks like emerald country if I am not mistaken. Are most of the finds around there alluvial, or do they find them still up in the mountain like at Graves Mtn.? I would have to agree, I picked up a specimen from Brazil, when I received it in the mail, I noted that the color was very similar even though it looked more blue online. I should probably put the piece in muriatic acid sometime, it would probably brighten up that much more. Hey Johnno those are pretty interesting. I haven’t a clue what they are but they do have a similar appearance to thomsonite. Adam the rock maybe agate now but it started out as something else. Look at the cell structure. That looks like fossilized dinosaur bone to me. 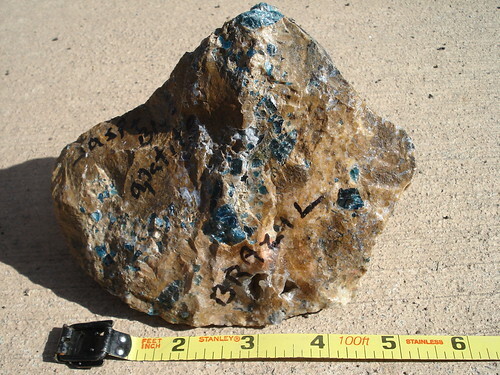 emerald country is limited in the area to the Crabtree Mine just SW of Spruce Pine, that pegmatite is very isolated and comes to the surface just east of the black mountain chain. 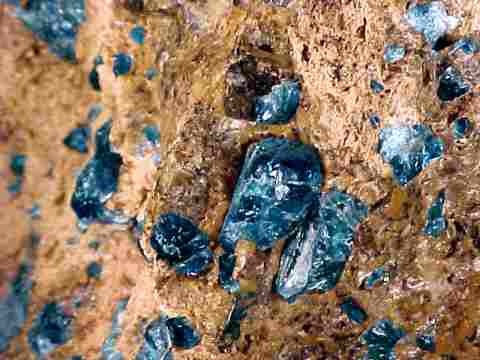 The other emeralds in NC you hear about, Jamie Hill's major finds at the North American Emerald Mine, are much further east in Hiddenite, and a totally different geologic occurrence. The Ray Mine is arguably the most well known mine in the black mountains with beryl being the major attraction(same base mineral as emerald, lacking the chromium). Just up the hill from there is the MAs-Celo Mine, both were mica mines, Mas-Celo's major by product was kyanite. You can still find the kyanite in-situ in the pegmatites, in recent history the Walker Creek occurrence was a very well known site that simply got blown out and irresponsibly dug, leading to the NF shutting it down. Some of my best finds were alluvial, mostly on the east facing slopes of the black mountains, but you can find it on the east or west side, and at the southern and northern extents. My knowledge of kyanite is that metamorphically it formed under intense heat and pressure, the major uplift that went on in the Black Mountains explains why it's there. There are definitely some interesting instances of the kyanite forming with other minerals, the most interesting to me is where you can find blue corundum imbedded in a kyanite matrix. Commercially, there area was well known for mica being processed from the pegmatites, but i'm sure kyanite was explored and mined for its properties. Modern day there's still a mine in Virginia mined solely for kyanite, Willis Mountain, but this kyanite is closer to the look of that from Graves Mountain. Back in NC, kyanite even rarely occurs on Chunky Gal with all the corundum, the Black Mountains yield the best quality, but its also found at Mason Mountain Mine, you can find it near Falls Lake north of Raleigh,NC, also in Rockingham County, i'm sure various other areas as well. also, no need for muriatic, we use super iron out, it is much safer and just as effective.